With all of the rigmarole at the very top of the UFC’s light heavyweight division (Jon Jones’s legal troubles, Daniel Cormier capturing the vacated belt, deciding Cormier’s next opponent) it’s easy to forget that there are two very, very good fighters ranked just below the immediate title mix. Those two fighters meet in the main event of Saturday’s UFC Fight Night event. Glover Teixeira and Ovince Saint Preux will look to remind everyone of the very real threats both pose to their 205-pound contemporaries. When Teixeira met Jones for the belt in April 2014, many people thought he was the most likely challenger to take the belt from the champion. Things obviously didn’t end up going that way, and Teixeira would also lose his follow-up Octagon appearance to Phil Davis. Since then, the Brazilian powerhouse has been linked to potential fights with Rashad Evans and Alexander Gustafsson before ultimately finding himself matched up with Saint Preux. In the former Tennessee Volunteer football player, Teixeira will find a man whose last five UFC wins have all come by stoppage. OSP put away both Patrick Cummins and Mauricio “Shogun” Rua with strikes, but also owns five pro wins by submission (including two in the UFC). Teixeira won’t go out so easily, though, and this main event should help determine whether Teixeira or Saint Preux is still deserving of a top UFC ranking. Saturday’s card also features an exciting lightweight match-up between No. 5-ranked Michael Johnson and No. 12-ranked Beniel Dariush that could produce a near-future title contender, as well as a middleweight scrap between Derek Brunson and Sam Alvey, a couple of guys riding winning streaks and looking to break into the elite of the division. UFC Fight Night: Teixeira vs. Saint Preux takes place Saturday, Aug. 8, from the Bridgestone Arena in Nashville, Tenn. The card begins at 6:30 p.m. ET with three bouts on UFC Fight Pass, followed by the remaining preliminary fights airing on Fox Sports 2 at 8 p.m. ET and the main card on Fox Sports 1 at 10 p.m. ET. Combat Press staff writers Sal DeRose and Eric Reinert break down the fights in this edition of Toe-to-Toe. Ovince Saint Preux enters this main event with a 6-1 mark under the UFC banner. He’s set to meet Glover Teixeira, who lost in his title bid against Jon Jones and then suffered another setback when he encountered Phil Davis. If OSP can get past Teixeira, will he have done enough to enter the title mix? Does his one loss, to deserving title contender Ryan Bader, keep OSP on the outside looking in regardless of the outcome of this bout? DeRose: A loss to Bader doesn’t set a fighter back in the light heavyweight division. Saint Preux simply lost to a better fighter. A victory over Bader would have been a quality win for the 32-year-old. OSP has really taken a turn and recovered from that loss with back-to-back wins over Mauricio “Shogun” Rua and Patrick Cummins. Those are some quality names, despite Rua seemingly slipping a little bit in recent times. OSP can win this fight if he can land the right shot. 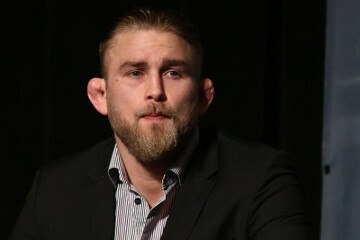 He has flashed power in his UFC tenure with three straight knockout victories, including in his last two fights against the aforementioned Cummins and Rua. OSP has nine knockout victories overall. Teixeira is certainly going to want to stand, as his boxing is really his comfort zone inside the Octagon. 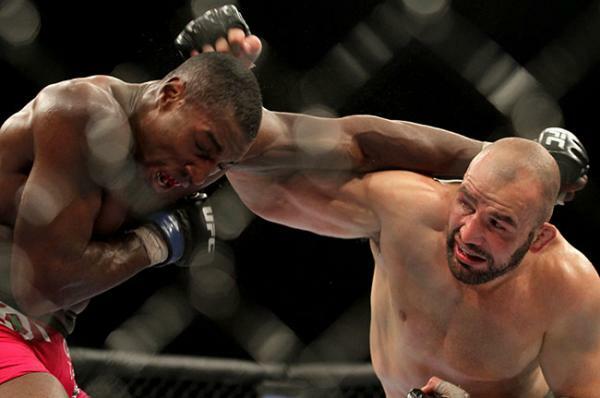 It really just comes down to whether OSP can land a hook or an uppercut that obliterates Teixeira. Based on past evidence, I’d say yes, OSP can. A win is big for Saint Preux. 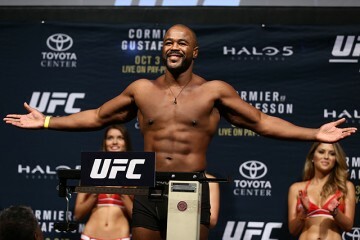 Teixeira is certainly a top-five light heavyweight and the division isn’t exactly known for its depth. It isn’t exactly the welterweight or lightweight division, so earning a top-10 spot is relatively simple for OSP if he adds a win over Teixeira to a resume that is already strong. OSP is actually ranked sixth in the division, so a title shot seems pretty close if he can make this a fantastic knockout victory that propels him past Bader in terms of exciting performances. However, I’m still picking Teixeira in this fight. The Brazilian has some legit striking that makes him a terribly hard out for anybody except guys who are fantastic wrestlers (or someone named Jon Jones). OSP isn’t quite there yet. This is certainly Saint Preux’s biggest fight thus far in his career, as he is getting a former title challenger who has only fought the best in the division recently. Boxing and experience, however, give Teixeira an edge that is just too hard to overlook. Reinert: Yeah, a striking victory over a guy like Teixeira who has never been stopped is not going to be easy. OSP is an inch taller and will enjoy a four-inch reach advantage on Saturday night, but it would take a hell of a good boxer to be able to keep Teixeira just enough on the outside to tune him up with jabs without also taking some heavy fire from the Brazilian in return. If OSP is going to win this one, he’s going to need to employ the same strategy as Davis did — put Teixeira on the ground and keep him there. Saint Preux is certainly nowhere near the sort of high-caliber wrestler that Davis is, but he did play NCAA Division I college football as a defensive end and linebacker, so he definitely knows how to tackle. Perhaps that’s reaching, but I don’t think it’s completely beyond the realm of possibility that OSP grinds out a decision win here. Even if he’s successful on Saturday, though, OSP will need a win against one more guy currently ranked ahead of him before ascending to true contender status. I’d say an additional victory over the winner of Bader/Rashad Evans or Anthony “Rumble” Johnson/Jimi Manuwa would do the trick, but the point is that Saint Preux is still at least two more wins (including Saturday against Teixeira) from being considered a serious title challenger. I don’t think it’s going to happen. 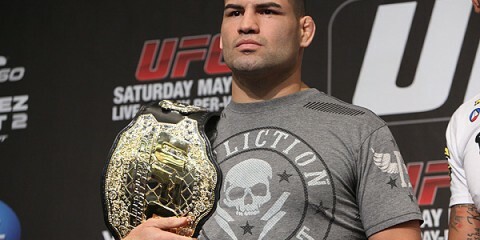 Teixeira blitzed through everyone in front of him (including Bader) when he first arrived in the UFC, and just because he lost to one of the greatest fighters of all time and then to a former NCAA national champion in wrestling does not mean that the light heavyweight division should not still be on high alert. Height and reach disadvantages notwithstanding, all Teixeira needs to do is step inside OSP’s range and land an overhand bomb and it’s pretty much going to be over. Unless, as I mentioned, OSP can completely avoid Teixeira’s punches and find a way to take him down and keep him down, I see Teixeira breaking his current two-fight losing streak in a mean way. I’ve got Teixeira by TKO here, and it’s going to get ugly. Below the headliner in the lineup, there’s a lightweight co-main event between Beneil Dariush and Michael Johnson and a main-card clash between middleweights Sam Alvey and Derek Brunson. All of these men are in or near the top 15 in their respective divisions within the UFC rankings. Which one of these fighters makes the biggest statement at UFC Fight Night 73? Reinert: Since debuting in the UFC in January 2014, Dariush has quietly put together a very impressive 5-1 record, including wins in his last four. He’s been especially fun to watch in his three most recent fights, when he put a stop to Carlos Diego Ferreira’s 11-fight winning streak, submitted Daron Cruickshank and then earned a decision win over longtime lightweight stalwart Jim Miller. On Saturday, the 26-year-old jiu-jitsu black belt gets his toughest test yet in No. 5-ranked Johnson, and it’s one Dariush is going to pass with flying colors. 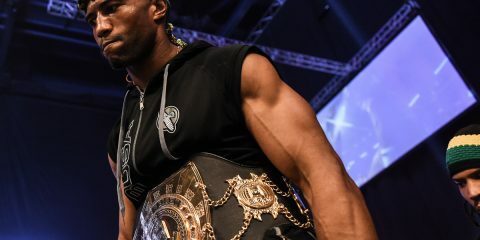 Johnson has definitely earned his high ranking in the division with four straight wins of his own, including his decision victory in February over fellow top-10 lightweight Edson Barboza. Here’s what gives me serious doubt about his ability to make it five in a row, though: six of Johnson’s eight professional losses have come via submission, and that just happens to be Dariush’s bread and butter. If this one goes to the mat, and I think it will, Dariush is going to raise some eyebrows with how quickly he’s able to sink in a choke. When he does, he’ll presumably raise his ranking from No. 12 to somewhere around No. 6 or No. 7, when he’ll then have to face the Cerrones and Hendersons of the division. I’m not saying Dariush is going to be the next breakout lightweight contender, but he’s probably got several years left in his MMA career, and I don’t think we’ve even seen his best stuff yet. DeRose: I’m going to go the opposite way here and pick Dariush’s opponent, Johnson. While I’m not saying Dariush is going to look completely outclassed, I think Johnson is going to show how strong his skills are in this amazing career turnaround. It’s actually weird to think that Johnson, the current No. 5-ranked lightweight, was at one point 9-6 after being submitted by Paul Sass via heel hook. Seriously, think about that. A 9-6 record and now he is a top-five fighter in arguably the deepest division in the UFC. It’s absolutely incredible, so props to Johnson. Johnson is going to bring this fight to the mat. It’s inevitable. The 29-year-old is an extremely strong wrestler and will look to score the takedown despite Dariush’s submission skills. This is where things get interesting. Dariush needs a finish in this fight. I can’t see him beating Johnson by decision. There are going to be a lot of takedowns and Dariush is most certainly going to look to counter them with guillotines and use submissions to advance or reverse position on the ground. Johnson has faced some stiff competition on his current winning streak, though, and that tips the fight in his favor. I don’t want to finish answering this question without saying that Sam Alvey is a strong candidate for making a big statement as well. Alvey is on a three-fight winning streak and all of his wins have been knockout finishes. That includes his “Performance of the Night” bonus in February with a straight knockout over the Brazilian Cezar “Mutante” Ferreira in Brazil. I can’t count him out for making yet another big statement on Saturday. There was quite a bit of well-deserved hype behind Sara McMann when the Olympic silver medalist first transitioned to MMA, and she certainly seemed to live up to it before her 66-second title-fight loss to Ronda Rousey last year. Since the loss, McMann has gone 1-1, with her loss coming against Miesha Tate, and on Saturday faces Amanda Nunes. Will McMann ever make it back to title contention, or, at age 34, has time already passed her by? DeRose: I feel like every time we discuss a women’s bantamweight fight on a card, we always talk about title contention. There are two facts that make any fighter in the division a possibility for title contention regardless of how well they are performing or where they are in the rankings. One is the fact that the division is shallow. Two is that Rousey has almost literally beat the entire division, therefore leaving few options other than a turnover with the same contenders. Look at Tate, for example. Despite her two previous title losses to Rousey, Tate has fought her way back to another title bid with four consecutive victories. Age won’t have anything to do with McMann’s prospects. She is a tough wrestler, and if she can get her opponent to the ground, it will be a tough fight. Sure, she is 34 and might have limited time left in the sport, but I highly doubt we see her skills start to decline after only 10 professional fights and her Olympic career. McMann is currently the No. 4-ranked fighter at 135 pounds. That says a lot. There really aren’t many other fighters in the division who can stake their claim to a title shot right now. Holly Holm still needs at least one more fight to get the nod. McMann is realistically only a dominant performance away from throwing her hat in the ring, and she would probably need only one more win if she beats Nunes. I’m not really a fan of saying one fighter’s title contention days are over unless they truly show some diminishing skills. McMann hasn’t gone there yet. Her two losses are to the top fighters in the division. If Nunes can pull off the win, then maybe we can discuss McMann’s skills starting to deteriorate. Until then, McMann hasn’t convinced me yet that she is on her way down the hill. Reinert: I always thought that McMann’s world-class wrestling would give her the best chance to control Rousey en route to a potential win, but Rousey put any of those hopes to rest when McMann became her first victim to lose via strikes. I’ll also admit that McMann’s loss to Tate really surprised me, but I don’t think I was giving Tate enough credit at that time. My colleague makes great points when he talks about the sparse number of contenders not to have already fallen to Rousey, and for that reason McMann’s chances of a title rematch aren’t completely gone. Still, after her loss to Tate, McMann will need at least two wins to even be considered, the second of which will have to come over a fellow member of the top five. So who knows how long it will actually be before McMann meets Rousey again, if it happens at all. Instead, I’d love to see McMann fight Cat Zingano or Alexis Davis on the main card of a future UFC pay-per-view. Even if those fights don’t ultimately result in a title shot for McMann, they sure would be fun to watch. Two flyweight fights take place on the card. One features Ray Borg, who is coming off of two straight “Performance of the Night”-caliber victories. The other is a fight between Willie Gates and No. 12-ranked Dustin Ortiz on the prelims. Can any of these fighters make a case for title-contention status with a win? Do any of them have a legitimate chance at beating champion Demetrious Johnson? Reinert: We’ll go with “yes” and “no,” respectively. Like the women’s bantamweight division, the UFC’s smallest men’s weight class finds itself with a champion whose dominance has left the company occasionally scrambling to find a suitable challenger. With these circumstances in play, I think either Borg or Ortiz could very well find themselves standing across from Johnson in the future. I’ll talk more about Borg in the next question, and Ortiz’s only two UFC losses have come to highly ranked former title contenders, so I think either of these young fighters, with a little more consistent success, has a chance to fight for the belt sometime in 2016. Now, getting that title shot is one thing, but taking the belt from Johnson is another story entirely. The man has simply shown no weaknesses during his time as champion and seems to have a grip on the title that won’t soon be loosed. That’s not a knock on Borg or Ortiz, but simply an honest (if somewhat reverential) assessment of Johnson’s greatness. DeRose: Ortiz is in an interesting spot in the flyweight division. His last fight was a loss to Joseph Benavidez, who has become the perennial No. 2 at 125 pounds. That makes a win over Willie Gates a tough one to gauge when determining where it puts Ortiz in the division. 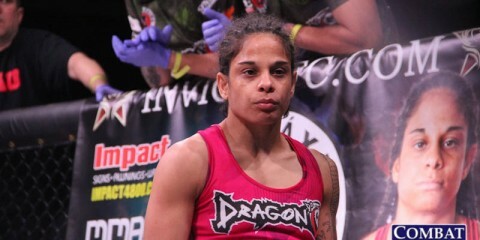 Ortiz will most likely land in the back end of the top echelon of the flyweight division. However, even with a win, he will most likely need at least two more victories if he wants to be considered for a title shot. Those next two fights will have to come against top-five opponents. Ortiz is only 26-years-old and represents a fresh face to challenge Johnson, which certainly helps. It also helps both Borg and Gates in that manner as well. Borg is already in the top 15, but his opponent, Geane Herrera, is a UFC newcomer who isn’t exactly a name off which Borg can build a title berth. What Borg has going for him is his age — he’s 22 years old — and the fact that he has been absolutely exciting during his winning streak. Borg has an absolute world of potential if he can beat Herrera and face off against, let’s say, Ortiz in his next fight and claim a win there as well. Gates is a late replacement, so this fight won’t be held against him. He fought only a month ago and was very impressive in getting the TKO victory over Darrell Montague. A win over Ortiz would help Gates break into the top 15. Out of all these fighters, none are poised to enter into title-contention status just yet, but that could change with a win here and a win in their next fight. Johnson isn’t an easy fight by any means. Every time the champ fights, he gets better in every facet of the game. He is easily one of the top pound-for-pound fighters in the world. There is only one guy in the division that could potentially defeat him, and that is his next opponent, John Dodson. That doesn’t mean Borg, Gates and Ortiz couldn’t possibly score an upset over Johnson, but they need to improve and fight a perfect game plan in order to beat the champ. Borg, due to his youth, vast potential and the time he has to improve his game, appears to have the best odds of becoming Johnson’s biggest threat. DeRose: It’s definitely the flyweight match-up of Willie Gates and Dustin Ortiz on the prelims. Gates is making a quick turnaround after fighting only a month ago. 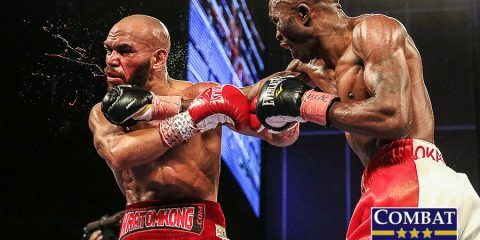 He looked really impressive in his TKO victory over Darrell Montague, a finish that brings his career knockouts total to five. In his last 10 fights, Gates has either been finished or stopped his opponent. Things likely won’t change when he meets Ortiz, who is an exciting fighter in his own right. Ortiz has been in some close fights during his UFC tenure and gets another tough match-up here. Reinert: I’m excited to watch Ray Borg fight again, which he does against Geane Herrera in Saturday’s first main-card fight. Borg has compiled an 8-1 professional record despite just having turned 22 years old, so I expect him to quickly rise in the flyweight ranks from his current spot at No. 14. He did lose his UFC debut (to the aforementioned Ortiz), but then rattled off two straight submission wins. On Saturday, Borg will welcome undefeated UFC newcomer Herrera to the Octagon. Of their combined 16 pro wins, 11 have come via submission, so I expect some slick grappling in this one. Given the current state of the flyweight division (Demetrious Johnson’s dominance combined with an already sparse roster), all it will take is about three or four straight wins for either of these fighters to enter the title picture, and Borg is nearly there already. I’m looking forward to this one for sure. Reinert: The easy answer here is whiskey, given Saturday’s event locale, so I’m gonna swerve you and suggest you learn how to make a Brandy Old Fashioned. It’s a drink native to my longtime former home state of Wisconsin, and it’s a delicious twist on a cocktail typically served with whiskey. DeRose: Considering this is the last card in a long string of weekly events for the UFC, maybe some sleep and a free weekend following the card. That fatigue might be settling in there, if hasn’t already, so take some time off and enjoy the next weekend following this card with some freedom from MMA. I hear Ant-Man is a good movie to see.